Yoda? Is It Thou? Figure In 14th-Century Manuscript Looks Familiar : The Two-Way A long time ago, in a place far away, a manuscript was created with an enigmatic figure who looks a great deal like a certain little — and yet powerful — green guy from the Star Wars films. A religious volume from the early 1300s includes this image of a monk who resembles the Jedi Master Yoda of the Star Wars films. A long time ago, in a place far away, a manuscript was created with an enigmatic figure who looks a great deal like a certain little — and yet powerful — green guy from the Star Wars films. It's an unlikely connection between a religious tome and science fiction. 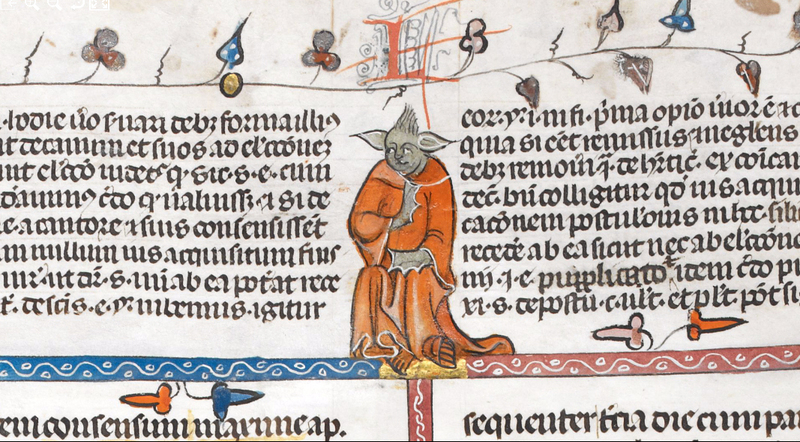 The similarity to Jedi Grand Master Yoda was recently highlighted by historians Damien Kempf and Maria L. Gilbert on the British Library's Medieval Manuscripts blog. Curator Julian Harrison, who runs the blog, also mentioned the drawing when he spoke to The Guardian about his job and the new popularity of illuminated manuscripts on the Web. It's an interesting interview — but we couldn't stop wondering: What about that Yoda guy? "The Yoda image comes from a 14th-century manuscript known as the Smithfield Decretals," Harrison said, after we reached out to the British Library. "I'd love to say that it really was Yoda, or was drawn by a medieval time traveler," Harrison continued. "It's actually an illustration to the biblical story of Samson — the artist clearly had a vivid imagination!" The volume is also known as "The Decretals of Gregory IX with gloss of Bernard of Parma," and it was created in southern France between 1300 and 1340. Decretals, we learned today, are collections of papal letters that compiled decisions (decrees) on church law and doctrine. We're not suggesting that this decretal might be one of the anthropological antecedents (or to the layman, "sources") that Star Wars creator George Lucas used to enrich his stories of a galaxy far, far away. But the resemblance is striking — those ears! And after all, Yoda was supposed to be around 900 years old.